Hope HealthCare Services has been lovingly supported by volunteers for its entire three decades. Each day, they share their time with others, making a difference in the lives of people in life’s final chapter. They come from all walks of life, including from local high schools and universities. Hope has made the volunteer program meaningful and enjoyable for students. Breanna said Hope helped her family when her father was a hospice patient, and she wanted to give back. In her words, “You get as much as you give.” She added, “Volunteering at Hope teaches you how to deal with life, how to relate to other people and situations.” As a psychology student, that is important to her. Shane said he was apprehensive on his first visit with a person on hospice care. “When I crossed the threshold into his room for the first time, I didn’t want to appear to be patronizing, but it was never that way. I thought he would want to talk about his condition; he wanted to talk about life, and he was interested in my life.” Shane says this experience will make him a better physician someday. “Just as our student volunteers enrich the lives of others in the community, they have the opportunity to enrich their own lives through our unique learning and social experience,” according to Hope President and CEO Samira K. Beckwith. Breanna and Shane agree that regardless of where your studies may lead, service as a Hope Student Volunteer is the right choice as a foundation for career and for adulthood. As Shane said, “There is a major need for people to understand” the special needs of others. Breanna knows that she will continue to get as much as she gives. The Howard E. Hill Foundation, Inc. of Belle Glade is helping Hope Connections in providing nutritious meals to hundreds of elderly residents of Hendry and Glades counties. The Foundation has awarded a grant of $20,000 to Hope Connections, a program of Hope Healthcare Services. Through the program, people age 60 and older in Glades and Hendry counties receive vital help in their daily lives. Services include hot meals, personal care, homemaker services, household chores, transportation, medical equipment, counseling and emergency response systems. In the past year, Hope Connections provided more than 35,000 meals to residents. The Hill Foundation grant will help the agency to continue to provide that vital service. The Foundation is named in honor of Dr. Howard E. Hill of Belle Glade, who practiced veterinary medicine and became deeply involved in helping local families obtain affordable housing. In his memory, the Foundation recognizes that a strong community supports the residents within it. Samira K. Beckwith, president and CEO of Hope HealthCare Services, has been selected to serve on the Six Pillars Caucus, the Florida Chamber Foundation’s expanded research and policy development effort focused on improving Florida’s economic plan for the future. Beckwith was selected based on her visionary leadership of Hope HealthCare Services since 1991, when the organization served fewer than 100 patients a day to more than 2,000 patients today in Lee, Charlotte, Collier, DeSoto, Hendry, Glades, Hardee, Highlands and Polk counties. Hope is now one of Southwest Florida’s largest employers and has the broadest geographic service area of any hospice organization in Florida. The product of years of collaboration and research by the Florida Chamber Foundation, the Six Pillars identify critical factors determining Florida’s future: talent supply and education; innovation and economic development; infrastructure and growth leadership; business climate and competitiveness; civic and governance systems; and quality of life and quality places. As a member of the Quality of Life and Quality Places caucus, Beckwith will provide strategic recommendations, including corresponding public policy, to be shared with the Florida Chamber of Commerce and other partners in the Six Pillars to help develop priorities for Florida’s economic agenda. “Florida is moving toward its next economy, and the foundation’s new caucus system will prove to be an invaluable framework to help get us there,” said Jeff Lyash, chairman of the board of trustees of the foundation and executive vice president of corporate development for Progress Energy Florida. She has been recognized for professional and personal achievements on the local, state and national levels. Most recently, Beckwith was awarded the 2010 Ellis Island Medal of Honor, one the nation’s most prestigious awards, and in 2009 received the Alumni Medalist Award from The Ohio State University Alumni Association and the Lifetime Achievement Award from the Stevie Awards for Women in Business. Beckwith’s previous honors include the APEX Award from the Greater Fort Myers Chamber of Commerce, Gulfshore Life Magazine’s Woman of the Year, Survivor of the Year for the Susan G. Komen Race for the Cure, and the Junior Achievement of Lee County’s Business Leadership Hall of Fame. 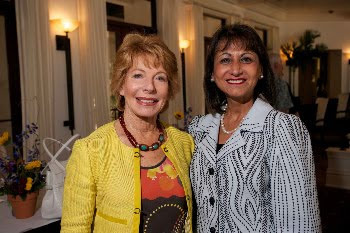 Beckwith, speaking about becoming caregivers for our loved ones, hosted a July 1 event featuring national best-selling author Gail Sheehy, who presented to nearly 100 Hope HealthCare Services supporters. Sheehy’s discussion was based on her book, “Passages in Caregiving: Turning Chaos into Confidence.” The nonfiction work chronicles the challenging path Ms. Sheehy followed in caring for an ill spouse for 17 years. “Fortunately, those of you who live in Southwest Florida have one of the premier health care systems available to you in your own community through Hope HealthCare Services,” Sheehy said, citing Hope’s broad spectrum of care designed to help persons of all ages who are diagnosed with a life-changing illness. One program Sheehy recognized specifically was PACE, a Program of All-Inclusive Care for the Elderly that Hope offers in Lee County and soon in Charlotte. Available to adults over 55 who qualify for Medicare part A & B or Medicaid, PACE serves those who qualify for nursing home care but want to maintain independent living. The innovative program – offered in only 75 locations in the U.S. – provides help acquiring medical services and supplies, transportation, social and wellness programs and expressive therapies. Guests at the event each received a copy of Sheehy’s book, which was personalized during a book signing opportunity following the presentation at Miromar Lakes Beach & Golf Club.